Back in 2012 Fishing 101 for Women was founded, giving an outlet for like minded women to connect and develop. Fishing 101 for Women is a non-profit organization that offers free seminars and instruction for women interested in learning the basics of recreational fishing. 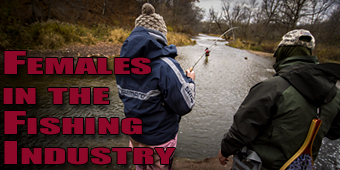 The Great Canadian Female Anglers (GCFA) has been reaching out to female anglers, helping them meet other female anglers, empowering them and helping them move forward in the sport. Girls as young as 10 years old are becoming members of the GCFA.